BECKHOFF Automation introduces a new range of extended temperature bus terminals and couplers designed specifically for extreme climates. 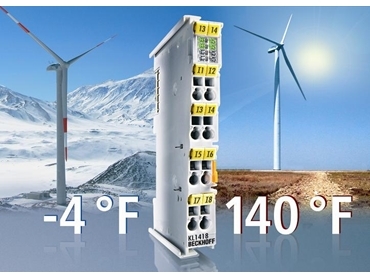 The new extended temperature range increases I/O application flexibility. Beckhoff supports applications in extreme climatic regions with the extension of the operating temperature range for selected standard bus terminals and couplers to between -20ºC and +60ºC. The storage temperature of the ET bus terminals (Extended Temperature) is specified at an impressive -40ºC to +85ºC range. Beckhoff’s bus terminals have been proven in machine and building automation applications where a temperature range of 0ºC to 55ºC is sufficient. Beckhoff has extended the operating temperature range for selected standard bus terminals and couplers to between -20ºC and +60ºC making them ideal for outdoor applications. These bus terminals and couplers are typically used in alternative energy systems such as wind, solar or tidal power plants, which in some cases have to operate under extreme climatic conditions. The I/O terminals selected for the extended temperature range cover the most common areas of application and a wide range of signal types. As an added benefit to users, the components for the extended temperature range are available at the same price as standard bus terminals. ET Bus Terminals may even enable users to save additional costs by reducing or eliminating the heating and air-conditioning requirements in the control platform. The CX5000 series embedded PCs with direct I/O connection are also designed for this extended temperature range. This represents a complete controller and I/O solution for extreme environments.